Finance Manager (DFM), District Panchayat Finance Coordinator (DPFC) and other vacancies in State, District, Block level. The total available vacancies in this BGSYS Recruitment are 698 posts. Interested candidates submit the application form through online using the BGSYS official website before 15-11-2017. Candidates will be selected for BGSYS Block/ District/ State positions is based on their merit basis in written test and followed by GD & Personal Interview. Date and venue of written test, Admit card related information are available at www.bgsys.gov.in/career/recruitment. 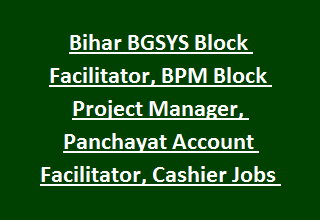 See the notification for Education qualification details, Age limit, Pay Scale for each post, Selection process, Application procedure of Bihar Gram Swaraj Yojna Society BGSYS Recruitment Block Project Manager (BPM), Block Facilitator, Panchayat Account Facilitator and other jobs 2017. Available vacancies in Bihar Gram Swaraj Yojna Society BGSYS Recruitment are 698 posts. Total no of vacancies: 698 posts. -District Project Manager (DPM): 10 posts. -District Social Development Coordinator: 09 posts. -District Monitoring & Evaluation Coordination (DM & FC): 12 posts. -District Finance Manager (DFM): 12 posts. -District Panchayat Finance Coordinator (DPFC): 12 posts. - Block Project Manager (BPM): 181 posts. - Block Facilitator: 204 posts. - Panchayat Account Facilitator: 204 posts. Block Project Manager (BPM): PG Degree/ Diploma in Rural Management/ Rural Development/ Agriculture/ Social Work with one year experience in relevant discipline. Block Facilitator: Graduate with two years relevant experience. Panchayat Account Facilitator: B.Com or equivalent qualification with 2 years experience in the field of Accounting and good IT Background. For detailed qualifications, please check the BGSYS notification. Age of the candidates for BPM, Block Facilitator, Panchayat Account Facilitator posts is 22 years to 55 years. Age limit for Cashier, Accountant Jobs is 25 years to 55 years. Please see the notification for other posts pay scale details. Candidates will be shortlisted for BGSYS Recruitment vacancies based on the marks obtained in the written test. Candidates will be sent to the GD and Personal Interview based on the score obtained in written test. Shortlisted candidates, Venue and dates of the written test, Admit card availability dates and other information available at www.bgsys.gov.in/career/recruitment. Candidates who are interested for BGSYS Recruitment jobs are advised to visit www.bgsys.gov.in/career/recruitment. Select the application for relevant position. Fill the application according to the guidelines. Last date for submission of application through online is 15-11-2017.